^ Rodgers, Paul. Up telescope! Search begins for giant new planet. The Independent. 2011-02-13 [2011-02-26]. ^ Wolchover, Natalie. Article: Astronomers Doubt Giant Planet 'Tyche' Exists in Our Solar System. Space.com. 2011-02-15 [2011-02-26]. 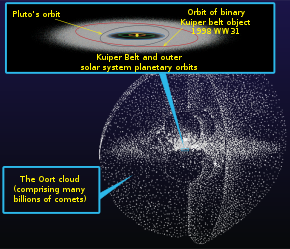 ^ 3.0 3.1 3.2 3.3 3.4 3.5 Matese, John J.; Whitmire, Daniel P. Persistent evidence of a jovian mass solar companion in the Oort cloud (PDF). Icarus. 2011, 211 (2): 926–938. doi:10.1016/j.icarus.2010.11.009. arXiv:1004.4584. ^ Natalie Wolchover. Astronomers Doubt Giant Planet 'Tyche' Exists in Our Solar System. space.com. 2011 [2011-02-19]. ^ 5.0 5.1 Plait, Phil. No, there’s no proof of a giant planet in the outer Solar System. Discovery Magazine. 2011-02-14 [2011-02-26]. ^ Whitney Clavin. Can WISE Find the Hypothetical 'Tyche'?. NASA/JPL. 2011-02-18 [2011-02-19]. ^ Matese, John J.; Lissauer, Jack J. Continuing Evidence of an Impulsive Component of Oort Cloud Cometary Flux (PDF). University of Louisiana at Lafayette, and NASA Ames Research Center. 2002-05-06 [2011-02-26]. ^ Murray, John B. Arguments for the Presence of a Distant Large Undiscovered Solar System Planet. Monthly Notices of the Royal Astronomical Society. 1999, 309 (1): 31–34. doi:10.1046/j.1365-8711.1999.02806.x. Lay summary – Houston Chronicle (1999-10-11). ^ Matese, John J.; Whitman, Patrick G.; Whitmire, Daniel P . Cometary Evidence of a Massive Body in the Outer Oort Clouds. Icarus. 1999, 141: 354. doi:10.1006/icar.1999.6177. ^ Matese, John J.; Whitmire, Daniel P.; Lissauer, Jack J. A Widebinary Solar Companion as a Possible Origin of Sedna-like Objects. Earth, Moon, and Planets. 2006, 97 (3-4): 459–470 [2010-08-17]. doi:10.1007/s11038-006-9078-6. ^ Orbital period of a planet at a distance of 15000 AU with a circular orbit. [2011-02-26]. ^ Have UL Physicists Identified a New Planet?. University of Louisiana. 2011-02-14 [2011-02-16]. ^ Search on for Tyche, believed to be largest planet in the Solar System. Daily Mail (Daily Mail). February 14, 2011 [February 14, 2011]. This page is based on the Wikipedia article 堤喀 (假想行星); it is used under the Creative Commons Attribution-ShareAlike 3.0 Unported License (CC-BY-SA). You may redistribute it, verbatim or modified, providing that you comply with the terms of the CC-BY-SA.